Does your horse know how to Ground Tie? Have you ever had the need to ground tie your horse? Imagine yourself coming up at the end of a trail ride or needing to close the gate at the arena. You are standing next to your horse and HOPE he stays put. But alas, in those 3 seconds it took you to reach for and open the gate, your horse has pulled up a full mouth of luscious grass, stepped on (and broke) your new rein, jumped backwards with a head tossing flair, and trotted off towards the barn, road or somewhere you cannot quite get to quickly enough. Before you begin, make sure you take away the common problems that keep you from succeeding in this ground tie training. Remove the flies (fly spray works), find a bare patch of dirt for the first few training sessions (green grass is awfully distracting), and get away from any other distractions. 1. Connect with your horse. Take time to do some ground work. Practice walk, whoa, turn on the forehand, side pass, turn on the haunches, and backing….doing this with you on both sides of your horse. Make sure you have solid ground work and that your horse is paying attention to you and will immediately respond to your ground work cues/aids/commands. If you need to spend a few days reinforcing your ground work and ground manners — please do so — it will save you time in the long run. 2. Reinforce the importance of the word “Whoa”. Take a few minutes and make sure every time you stop your horse when you are walking him on a lead line, you verbally say “whoa” and pull down on the lead line ever so slightly, then let the lead line go slack. 3. Once you are sure that the connection to your horse is strong and the ground work is solid, begin testing and strengthening that connection. Open and close gates and doors and trailers and move bags and boxes while you have the lead shank in your hand. Reinforce that your horse is to pay attention to you when you are performing any action you might do when you ground tie your horse (another example is getting a saddle out of the tack room). In all of these actions, ask your horse to stand still — while you are still holding the end of the lead line. 4. As you get ready to begin the actual ground tie training. Make sure that you trust your horse. Begin the training by telling the horse “whoa,” pull down slightly on the lead line and then drop the lead line (so it goes slack) and walk away a few steps. Be confident that your horse will stand where you left him. Do not wait around once you say ‘whoa” and drop the lead line…make sure you walk away a few steps. You must establish that you want the horse to stay and so you must give the horse a chance to make the mistake so that you can correct the mistake and take the opportunity to train your horse to do the correct thing. 5. After you have dropped the lead line and walked a few steps, just as soon as your horse moves, immediately turn around and establish the connection to your horse (pick up the lead line) and back your horse with a purpose and authority (note: this is not being mean, simply being firm to correct the wrong behavior). I normally begin this training with an ~ 15 to 20 foot lead line. What this lets me do is to drop the part closest to the horse while still letting me have ahold of the tail (end) of the lead line. The cue for this command to ground tie for me is two-fold — I say the word “whoa”, then I pull down slightly on the lead line and drop it on the ground. It will take a few training sessions with your horse to get this command firm and listened to by your horse. Remember — make sure your ground work with your horse is very good, you are prepared and firm in your commands, and you use cues/aids that your horse easily can understand. Some horses benefit from having this training start in a stall or small paddock. We may all have some different ways of teaching to ground tie and I welcome you to share this blog and comment on additional ways you teach this important cue. The story of any great Thoroughbred might begin with talks of Man O’ War…some people may immediately think of Secretariat and of course many will think of Seabiscuit. Hollywood has done a fabulous job of sharing with us the greatness that comes with a Champion Thoroughbred. Not every story is full of wins, accolades and trophies…many have what we might call lesser stories and on this day I would like to share with you a different story – a magical story – one in which the participants play with “Cover Magic”. 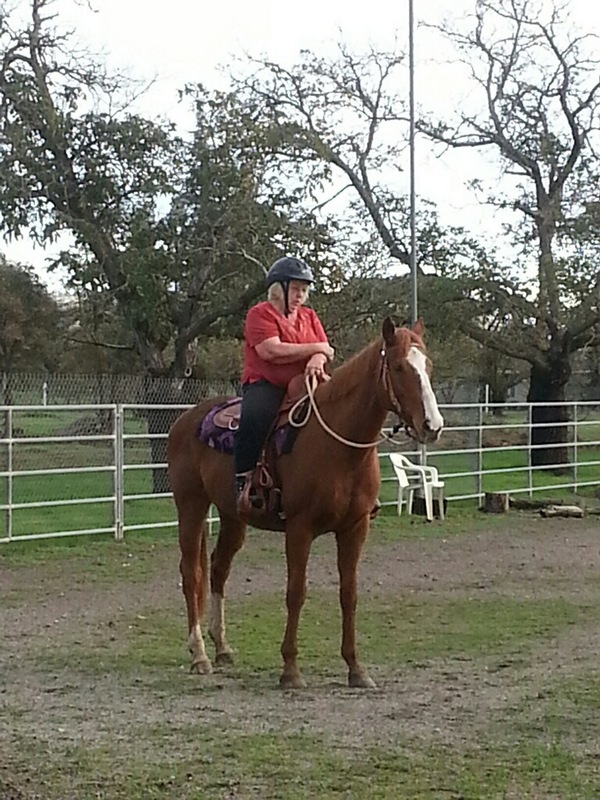 In November of 2014 I met two ladies and an Off the Track Thoroughbred. Cover Magic is his racing name – Chandler is what we call him at the barn. The story begins with the great Alydar who went on to be a top sire in the late 80’s and early 90’s — Alydar’s progeny won at a top level for so many years. Well as a top line, it was bound to be well represented throughout the thoroughbred racing industry. Cover Magic, a grandson of Alydar, has over $200,000 in career earnings…yet, when he came to the end of his racing career…there was no fanfare when he retired. Cover Magic was sold and his trainer moved on to the next horse in the barn … all the while thinking and believing that Cover Magic had gone to a good home. Our story jumps to just a few years ago. Laura and her team from Perfect Fit Equine Rescue in Morgan Hill California were called to the local Humane society. A large horse had been found abandoned and in very poor condition in a creek bed. He was not using his right hind leg very well. Part of Laura’s team consists of a deeply knowledgeable horsewoman …Ruth who just recently turned 70. Ruth immediately jumped in and saved the tail on Cover Magic when the human society officer thought it would be best to cut it all off. Ruth spent hours getting the tail combed out. You thought the story was pretty good so far…it gets way better. Ruth and Angie continued to rehab Cover Magic. Lots of Groundwork and Round Pen work. A Dressage trainer spent some time working with them on getting that partnership these two ladies desired. About 18 months ago, Ruth hit a point in her life where the right knee had become useless and she had a choice – To have the knee replaced so she could ride again – or to just let the knee continue to deteriorate until she had to have surgery and likely hobble around. One evening, Ruth had a conversation with Cover Magic and the two decided that surgery for Ruth was the best option. Her family could not convince her to have surgery…but the Love of this OTTB – helped her decide. Ruth rehabed her knee and Angie continued to work with Cover Magic. The first few rides for Ruth on Cover Magic after her surgery were not the most successful — a few slide off’s, a near fall, and what seems like a clear fall and bump. Was this story to come to an end? Had the knee surgery been for not? A friend of mine at the rescue called and asked me to see if I had anything I could figure out to help give Ruth the chance she wanted. I pulled out Mom’s new Saddle from Charles Wilhelm that was set up right to help mom with her balance (mom is 70+) and went and told Ruth I had a plan. We got Ruth on Chandler and she had a successful ride, followed by another successful ride and another success. Before I knew it Angie was also riding (Ruth and Angie purchased a saddle from Charles) and we were all making plans… – These plans were to get Cover Magic into his second career…..a career as a dressage horse. In comes North American Western Dressage (NAWD) and the Virtual Show format. Because virtual shows allow you to show at home and these ladies did not have a trailer we had a plan. NAWD is a leader in virtual shows and along with Cover Magic making his debut, other riders at Perfect Fit Equine Rescue all made their first Western Dressage rides…and they plan to be back with more rides in July 2015. Angie and Cover Magic made their show debut with the North American Western Dressage May 2015 Trailblazers show. Using the Level 1, Test 1 from North American Western Dressage, Angie and Chandler scored a very respectable 61%…both had never been in a dressage show in their life. Now you may be asking — how about Ruth’s ride. Well she sat on the sidelines watching and coaching because just a few days after the show, she had to go back to the hospital for surgery yet again (she is doing great and itching to ride)…and the reason she went back in is because she and Cover Magic had a conversation once again about their dreams…and they still have a dream to show in 2015. Are you ready to ride? Can you see yourself having fun with a little showing? Did you think your dream of showing was falling apart — well Perfect Fit Equine Rescue and North American Western Dressage have shown you the way. Rescued horses, Western Dressage tests .. and some good old determination….this is what good horsemanship is about….this is what great Thoroughbred Race Horses accomplish…this is what two young friends can do when they set out to make the world better for at least one horse….this is what a 70 year old lady can do when she still wants to ride as she did when she was 16….this is what YOU can do with a virtual show opportunity. If you are pursuing your dreams and Western Dressage is one of your goals, make sure to seek out a Western Dressage Professional (CLICK HERE) to assist you and your horse on the road to success. — If you enjoyed reading of this success, consider working with your local rescue and seeing how you can help them or consider donating to Perfect Fit Equine Rescue so they can continue to serve the horses in need. Dr. Mike Guerini is a clinician and Lifetime Founding Pioneer of the Western Dressage Association of America, Professional member and Licensed Judge from North America Western Dressage, author of multiple Horsemanship books, co-inventor of the Equine Hydro-T and specializes in western performance based instruction and you can learn more about Dr. Mike and his 6 C’s of Horsemanship at www.dunmovinranch.com. Dr. Mike is also part of Coach’s Corral (http://www.coachscorral.com/), an online Horsemanship Coaching program that specializes in video coaching and the 5 Ride Program. Dun Movin Ranch is also home to the Equine Hydro-T (http://www.hydrot.com/).